School is using Smore newsletters to spread the word online. This round of Cross Council Workshops will be designed as true workshops to assist Councils with the development of your RFF and/or Seed Fund proposals, and an opportunity to share plans and ideas with your feeder schools. Locations to be announced. 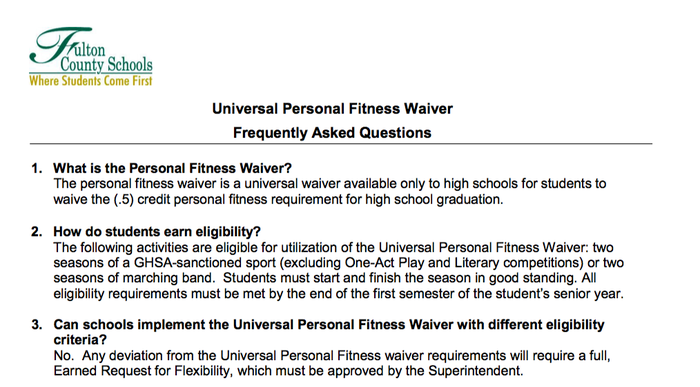 The personal fitness waiver is a universal waiver available only to high schools for students to waive the (.5) credit personal fitness requirement for high school graduation. To learn more about how to access this waiver, click the link below. Remember that in order to engage in the RFF or seed fund process, councils must be certified. Reach out to your facitliator if you have questions about your certification status. All new Council members must complete governance training. New Council members must be trained within 60 days of joining a school governance council. Governance training sessions are offered every month. Click here to sign up for an upcoming governance training. New parent and community Council members must also complete background checks through Fulton County Schools. Background checks will be offered at governance training sites.